Finnish industry will meet at the Subcontracting Trade Fair held in Tampere from 25 to 27 September 2018. Every year, there are 1,000 exhibitors from over 20 countries and 20,000 visitors attending the trade fair of industrial subcontracting, which is an event of worldwide renown. The Subcontracting Trade Fair celebrates its 30th anniversary, and the theme of the event is productivity. Startups and industrial companies will meet at the AlihankintaHEAT event that is organised in connection with the trade fair. This year, the event will last three days. The Subcontractor of the Year and the Main Supplier of the Year will be announced on the opening day. “The theme of this year’s Subcontracting Trade Fair is productivity. People often think that productivity can only be improved with automation and robots, which take our jobs. However, several company cases have shown that robotics has created new jobs. Productivity is about maintaining competitiveness and also competitive edge with investments and growth, as well as training people so that their skills will meet the requirements of working life in the future. Subcontractors of manufacturing industry have ensured their competitiveness by developing productivity continuously. The situation will hardly change over the next 30 years, so improving productivity continuously will be the prerequisite for success for the next 30 years”, says product group manager Jani Maja at Tampere Trade Fairs. The automotive industry is a sector where competition is global and standards are high. At Valmet Automotive, quality is at the heart of the operations – the customers set the requirements regarding product quality and the company then selects the processes and approaches to meet these requirements. By combining these, the company can ensure productivity and profitability. ”Our plant’s high degree of robotisation is often mentioned in connection with productivity, but the reason for using robots in car body manufacturing is no longer productivity but industry logic. Modern body manufacturing is not possible without robots, for example for quality and ergonomic reasons. However, we only use robots where it makes sense. Therefore, in the name of productivity we have deliberately kept automation to a minimum in the assembly line. It is part of the lean approach which aims for effective and simple solutions,” says Mikael Mäki, Communications Manager at Valmet Automotive Inc.
”The “secret” of Valmet Automotive’s success is an approach that brings together our expertise and resources with our customers’ requirements. We are also constantly developing our activities and anticipating customer needs, tells Mäki. 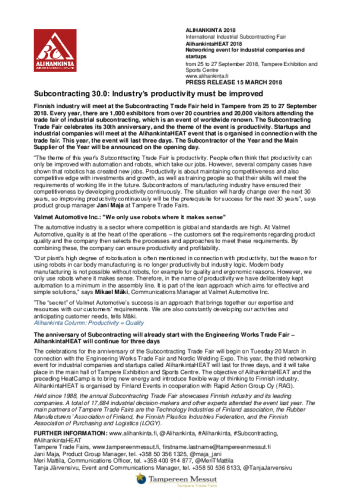 The celebration for the anniversary of the Subcontracting Trade Fair will begin on Tuesday 20 March in connection with the Engineering Works Trade Fair and Nordic Welding Expo. This year, the third networking event for industrial companies and startups called AlihankintaHEAT will last for three days, and it will take place in the main hall of Tampere Exhibition and Sports Centre. The objective of AlihankintaHEAT and the preceding HeatCamp is to bring new energy and introduce flexible way of thinking to Finnish industry. AlihankintaHEAT is organised by Finland Events in cooperation with Rapid Action Group Oy (RAG).